The Vollrath 5950275 is a black countertop induction warmer. This unit has a single burner that can hold a pan up to 14 inches wide. The black ceramic glass top is tempered to withstand high temperatures. Because of their low wattage, as many as three of these burners can be linked together with the included interconnect cord so that only one power cord has to be plugged in for the set. A compartment on the bottom of the warmer provides storage for the interconnect and power cords when they are not in use. 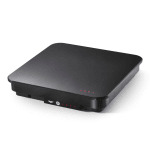 This commercial induction warmer has 4 power settings: low, medium, high, and chafer preheat. These settings are controlled with a touchpad, and LED indicator lights on the control panel and glass top display which setting is active. Overheat protection and empty-pan shutoff features prevent damage to the unit and other equipment as well as limits wasted energy. Can accommodate a maximum pan size of 14 in.